Welcome to a new series from Theresa at our Sales & Support Desk. Any support questions you want answered in the future? Let us know in the comments section. When purchasing fonts, you want to make sure that you choose the correct format. Here’s a brief overview of the different formats that we have available at FontShop. OpenType fonts are cross-platform and will work on both Macs and PCs. This format is best used with applications that support OpenType features, such as InDesign. Some OpenType fonts are created with PostScript metrics and others are created with TrueType metrics. Postscript flavored OpenType have .otf ending while TrueType flavored OpenType have .ttf endings. TrueType fonts will also work on both Macs and PCs. Certain Windows-based applications, such as MS Office, work best with this format because these applications have limited OpenType support. PostScript fonts only work on either a Mac or a PC, not both. This format is also referred to as Type 1 font. It is an older format that can be difficult to install in newer operating systems. Webfonts come in EOT/WOFF formats, which use @font-face to embed the font into your site. To make things easier we’ve added icons on all our products so that you know what format a typeface is available in. Use the guide below to help you navigate through our site. Earlier this month you met Theresa, who has spent four years assisting customers with support issues. Joining Theresa (and the other new faces at FontShop San Francisco) today is Mayene (pronounced “Mayan”), who will also be working on our Sales & Support team. How did you come into the customer service field? It goes along with being a graphic designer. You deal with clients on a daily basis, so you have to have some customer service skills. I teach violin too and you have to be there for your students. Finally, as an owner of an Etsy shop, I get a lot of customer requests. What are you most looking forward to as a FontShop employee? After college I got really into fonts. As a designer you get a lot of questions about typefaces from friends. Being able to help people with their font needs, professionally, is pretty exciting for me. What is your favorite typeface at the moment? At the moment is a good clarification! FF Scala. It’s such a huge family and includes both serif and sans serifs. Pretty classic looking. As summer winds down, our SF staff shares their favorite fonts of the month. We were thrilled to host a bevy of both designers and developers at our meetup event this week. Check out the recap here. FontShop recently added Canada Type‘s collection and this week David Sudweeks takes a look at some more of their offerings. Once again, Yves Peters points out two not-to-miss events in the type world: ISType and TYPO London. It’s Friday. Who doesn’t want a cocktail with their typography? Watching those empty calories? Here are some Extra Light options for you. Taking a look back over Canada Type‘s catalog this week, I’ve picked up on one of their specialties — digitally producing novel, historically significant types, the sources of which previously existed solely in analog. Robur is one such. In 1909, Georges Auriol concluded work in the vein of his art nouveau face Auriol with the release of Robur Noir. It was this latest face’s more conventional typographic structure perhaps that caused the type world to give serious attention to the effects of its unusual weight distribution. Oswald Cooper‘s 1921 Cooper Black and many more were soon to follow. Roos celebrates the work of Dutch type designer Sjoerd Hendrik de Roos. Its unmissable sharp calligraphic curves electrify the page at display sizes, and soften to a controlled sparkle as text. Canada Type’s digital adaptation includes both text and display weights, including small caps, and decorative initial caps. Adapted from Seventies film lettering, Jezebel plays up the psychedelic factor within a commercial brush script through generous swash alternates and modulation of stroke width and axis. The professional version includes bonus characters and bonus words. Bridging the digital divide, a group of around 75 designers and developers gathered Wednesday evening at San Francisco’s Storek Building to discuss how the two teams can work together. The group listened to a panel of three people who’ve successfully worked on both sides of the coin. Chris Palmatier of Neighborland gave great tips to designers looking to work with developers, and speaking to the developer side were Gregor Martynus, Founder of Minutes.io and Cary Dunn, CTO of Right Signature. An active Q&A session followed the panel discussion. It is good to have at least some understanding of what the other side does. If you are focused in one area that’s fine but you should at least find something in the other field that interests you and learn about it. Being a designer who knows a bit of PHP doesn’t hurt and being a Developer who knows something about color theory doesn’t hurt. Make the focus of your collaboration about the product—how it uniquely serves the user. CSS shouldn’t be scary to print designers, it’s exactly like setting up styles in InDesign when working in long-form documents. I don’t care if you are the best designer in the world, if we don’t share the same vision I would not hire you. You need to talk to people to be able to get a feel for them when you are hiring. Anyone can sketch the “essence” of a product, you don’t need to be a designer or developer per se. Important to establish wireframes before getting into visual design. The uglier they are, the better, because they represent the essence of the thing. Focus how a product works. Finding a designer depends on what kind of design and how technical the designer is. I mentioned playbook.thoughtbot.com last night. While it’s not specifically about the design/dev boundary, it’s a good window onto how an internet manufacturing concern works, which might require some demystifying for a designer who hasn’t yet dived into creating web products. Did you attend the event? What did you think? Meghan picks Agenda by Greg Thompson, after Edward Johnston. Because we deal with type mostly on a psychological level, the unknown element that tips the scales in favor of a specific design can be difficult to pin down. Quite commonly the answer is simple. On familiarity: Edward Johnston’s work for the London Underground answered a 1913 commission for a clear, modern type for transport signage. The face’s classical roman proportions themselves played off the familiarity of a roman inscriptional lettering style seen on signage produced by the Ministry of Works. Johnston’s pupil and contemporary Eric Gill famously explored the introduction of humanism to the sans in his similar Gill Sans. Just in time for the start of the school year, we’ve updated our education library with everything you wanted to know about webfonts and how licensing works. Did you miss our latest newsletter on Wednesday? Read it here. Then check out our new foundry, Canada Type, as well as the great new selections from Sudtipos and Three Islands Press. You can subscribe to newsletters on this page to get this font delight in your inbox twice a month. Our new type expert explores the FontBook for iPad. We’re pretty darn excited for our big designer/developer meetup on Wednesday. Are you coming? Can’t make it? What would you ask our panel if you could? Yves Peters highlights two film projects with a focus on type history. Speaking of film, help Yves show Austin what’s up with Trajan in Movie Posters at SXSW 2012. Today marks my first extended opportunity to flip through the new FontBook. 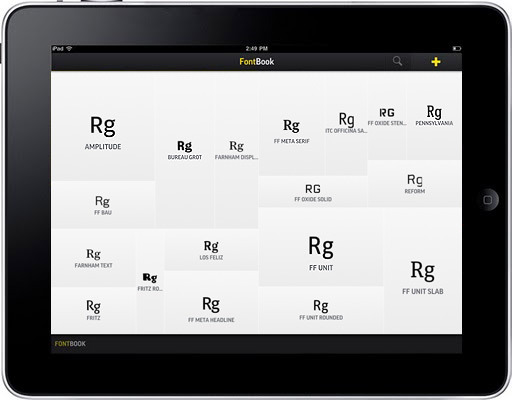 By content, FontBook for iPad is a three-volume encyclopedia with an alphabetical and a chronological index. Browsing by classes made it easy to dig through a lot of similar options at once. I had the most fun browsing by designer; something like skipping through an artist’s discography. I found that if you mark a font family with a star, you can run an alongside comparison with other ‘favorited’ families using the compare feature. It’s here also that you can see the type reversed over black, red, or in a number of high and low contrast color schemes. Clearly it’s not a physical book — and when designing for print, verifying the physical proof makes all the difference. But insofar as it’s used primarily as a discovery tool (same as what the old FontBook was used for), the new FontBook is handy for people working in print, and perfect for those mainly concerned with performance on screen. Poring over it for an hour or two this morning I still feel like I’ve only scratched the surface. Recently we reminded you of our education section on FontShop.com and today we’re happy to announce that we’ve added two new resources to the library. This semester we are guiding you through the world of webfonts and through the basics of licensing. The webfonts guide walks you through the files, shows you how to implement them, and directs you to tools that should help in the design process. Borrowing from a popular FontFeed post, our licensing guide takes you through the sometimes murky world of “free” fonts. We know that students utilize free and discounted fonts as they begin their design education. If a font isn’t free, remember that you can sign up for an account on FontShop.com with your .edu email address and use the promo code Educate10 to obtain 10% off your entire purchase. We’re very excited to have a new type expert on board in our San Francisco office. Meet David here. Join us on August 24 at our Designer & Developer Meetup. If you’re in The Netherlands in September, Yves Peters recommends you check out the “Now We Are Talking” festival. Then join others in London this October at TYPO London: Places. Are you following us on Twitter? How about Facebook? Keep the typographic conversations going across platforms! Yves’ ScreenFonts column returns with some gems, including pointing out a “Crazy Stupid” design mistake. FontShop welcomes David Sudweeks to the San Francisco office. By way of introduction, he answers here a few questions selected by the staff. How did you land upon being a “font expert”? Most type people can trace their love for fonts back to their early years and in this respect I’m no different. I always enjoyed the perusal of alphabets available as iron-on letters, chenille patches, stencils, in embossed tape labelers and calligraphic style manuals, etc.. Picking up webpage design as a hobby during the internet’s first coming of age, and my own, led me into the design profession. Working different jobs in print design expanded my ability to identify faces and spec their appropriate use. Around the same time I began pursuing lettering and type design on my own, and this out of necessity got me involved with the Typophile community. Learning to write convincingly about the formal qualities of words & letters, and experiencing the warmth of the type world at events like TypeCon were the final reassurances I needed to know that I could make it in type. Still, type expert? I guess so; though my first week here reminds me I’ve yet got plenty to learn. What are you most looking forward to working at FontShop? I’m here to do good writing and make good art. Anything else, like discovering with the rest of us what a Twenty-first Century type retail service shop looks like, will be icing on the cake. What are your top three typefaces at the moment? Williams Caslon from Font Bureau, rather than purporting to be another authentic revival type, is a beautiful portrayal of an idea called Caslon. Next, Compendium from Sudtipos. It’s so much fun to use! The pains taken to establish a sophisticated fit and care put into character design guarantees this face never to fall flat. Last, Wilhelm Klingspor Gotisch. Folks who know me know that I like a good, deliberate blackletter when occasion calls for it. Rudolf Koch, Europe’s foremost type designer in his day, drew this one—maybe just for me. And extra last, entry 4 of 3, I couldn’t pass up the chance to mention Marina Chaccur’s recent work out of the Type]Media program. (Permission to mention this just came in.) The Chic collection, comprised of a confident grotesque, a bold romantic display, and some fine lace, is designed to work together like the essential pieces of a well-dressed woman’s wardrobe. Before banging down Marina’s door please note that the collection is presently unreleased. Now bang down Marina’s door. Join Us for a Designer/Developer Meetup in San Francisco! Are you a developer looking to make your app or website more visually appealing? Are you a designer seeking opportunities in tech? Join FontShop and the Storek Building for Visual Meets Virtual, an informal evening aimed to connect developers and designers with one another to build beautiful projects together. Register via Eventbrite today. We’ll have plenty of refreshments and libations for your enjoyment and a brief, informal presentation by members of the design and development communities (with a short Q&A) on how they view the two disciplines interrelating. Attendees will also be among the first to hear some exciting news from FontShop — you won’t want to miss it! Cary Dunn, CTO, RightSignature. From the temperate and sleepy beachside town of Santa Barbara, Cary is the development and UI steamboat behind the e-signature company RightSignature. He is a crossbreed developer/designer, which means you’ll often find him wireframing in code rather than Photoshop. He lives his life at local coffee shops, spends late nights hacking code, and always has a few new products brewing. Chris Palmatier is a designer, developer, and artist whose restless muse keeps him bouncing between his text editor, vector drawing software, drafting table, and art studio. Over the past 10 years, he has worked as a full-stack web developer and interaction/visual designer, working to create tools that are both usable and delightful for the University of California, IDEO, and Civic Center/Neighborland.org, to name a few. When not working on Internet design and manufacture, he also works on print design and consulting for clients in the East Bay, designs furniture, and creates abstract paintings and sculptures. Chris holds a BFA in Fine Arts (Painting) from the University of North Carolina at Chapel Hill, and lives in sunny Oakland, CA. Gregor Martynus. Having a degree in Media System Design and working for years as developer, designer and in between, Gregor understands the different languages of both sides. Potential gets lost in translation and wrong expectation – let’s talk synergies. Gregor is the founder of minutes.io, an HTML5 app to take & share meeting notes. He enjoys working at coworking spaces and is moving once or twice per year. After San Francisco, he’ll move to Zurich with his wife. Spare time activities include traveling, photography and snowboarding. Did you miss our latest newsletter on Wednesday? Read it here. 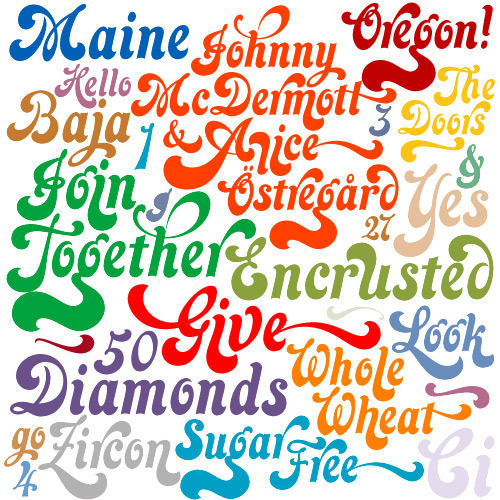 Then check out the great new selections from TypeTrust, Red Rooster, Alias, Emigre and Dalton Maag. You can subscribe to newsletters on this page to get this font deliciousness in your inbox twice a month. We’re hiring in San Francisco! Join us as a Systems Admin & Architect or Entry-level Sales/Support Representative. Learn a little more about our customer support team here. Did you know about our Education section or student discount? Learn about our resources here. FontBook can also be a great resource for those learning about type. Check out an interactive way to learn about classes and subclasses for each typeface. Yves Peters highlights a new mini-documentary on type and the 2012 Typodarium. And don’t forget, you can win tickets to TYPO London! On August 24, FontShop San Francisco is hosting a designer meetup with a twist. We’ve partnered with the Storek Building to create Visual Meets Virtual, an opportunity for designers and developers to connect on projects. There will also be pizza, beer and fun. School is starting soon and FontShop is here to help improve your typographic skills. Visit our Education page and download our PDFs created with students and lifelong learners in mind. Even if you just need to brush up on some terms or need a few tips, the Education page is a great resource to bookmark. Additionally, for weekly typographic tips you can follow @TypeTips on Twitter. Sign up for an account on FontShop.com with your .edu email address and use the promo code Educate10 to obtain 10% off your entire purchase. 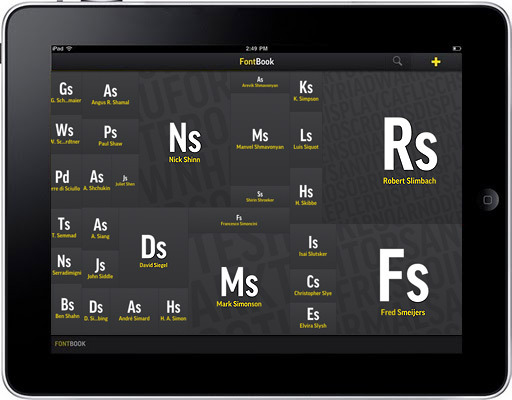 Now that we’ve unleashed the FontBook iPad app on the world, we want to take some time to show you all the goodies packed inside. Watch for our FontBook Features posts throughout the coming weeks. Also, remember if you have general questions about app, we’ll keep our FAQs documented here. As Yves Peters recently explained with his interview with the app development team on The FontFeed, one of the unique features of the app its robust classification system. With the involvement of type historian, typographer, author, and professor for Typography and Communikation Design at the Hochschule der Bildenden Künste Saar, Indra Kupferschmid, the team developed an impressive system of highlighting broad type categories and their subgroups. Clicking into the “Classes” section of the app you’ll initially see the seven main type categories: Sans, Serif, Slab Serif, Blackletter, Script, Display, and Pi & Symbols. But dig in, by tapping a class, and you’ll find each class has five subclasses within each. It’s easy to get lost for hours checking out each one.